In this case, my first spark of interest in the topic is recorded in a sketch I made from a tapestry I saw in the Victoria and Albert Museum in 1981. At the time that I first noted this object, I really didn't have sufficient background of knowledge to understand it in context. I filed it away and noticed it occasionally when I had other reasons to go through my old sketchbook. 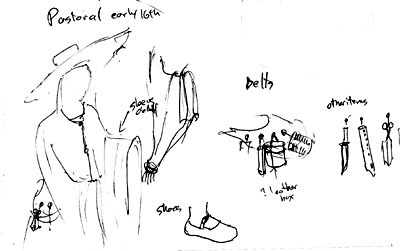 Many years passed, and then in the context of a question about the Rennaissance Faire custom of hanging tankards and other random objects off the belt, I recalled this sketch and went back to look at it. Once I'd re-examined my original sketches, it brought to mind other, similar objects I could remember seeing. But none of them satisfactorily addressed the question of how common or typical it would have been for a medieval or Renaissance person to have worn such things as tankards from a belt. And having realized how unusual the "medieval fanny pack" style now appeared to me, I was curious to know whether this was an isolated example or whether it was a common artifact. And -- I confess -- I was wondering whether it was a style that would be compatible with my SCA persona. When the Shepherds Purse again came to my attention, I was in a much better position to investigate it further. My personal library now included a lot more general and focused books on medieval art and artifacts. I was a graduate student at U.C. Berkeley with access to a world-class university library. And I had a more substantial level of general background knowledge to work from. I was ripe to explode into a research project.